Since we moved to Fort Wayne, we have not been able to find “real” Italian beef. Yes, there are Italian beef sandwiches on some menus in town, but they are not, in my humble opinion, authentic. The spices are off, or the meat is too dry… and no one has the giardiniera (a sweet and hot pepper mix), which is so essential to the taste and texture. Thankfully, we still have ties to Chicago and can get Italian beef when family visits. This past weekend, Jon’s mom came to town with Buona Beef, juice, giardiniera and Italian bread in tow. Oddly enough, you cannot get “real” italian bread here, only French, which is decidely not the same. It doesn’t have the same texture, nor does it have the ability to soak up the juice to the appropriate level. 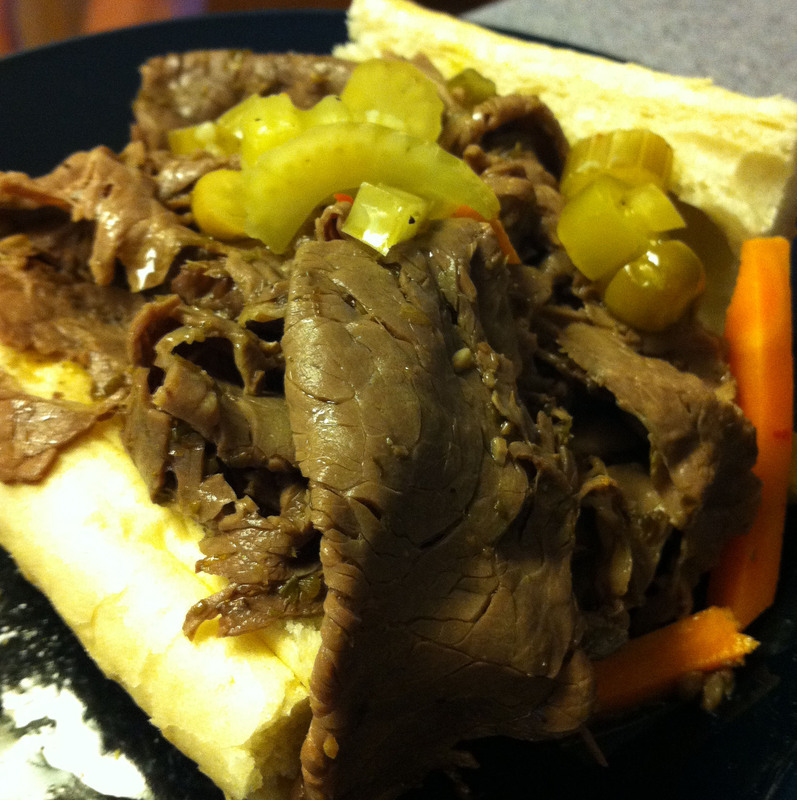 What this town needs is some “real” Italian beef. That would make the Recker’s very happy, indeed. Being a Chicago native I can tell you that where I have had a plethora of beef sammichs, and Buona Beef, well it was never my favorite. I grew up on Jay’s and Al’s – and the occasional Portillo’s (but usually always opted for the hotdog and tamale’s there). Tho it is decidedly better then anything I have had here. But regardless of all the short comings – it sure does the trick when you are missing home. My husband likes Al’s too. I am not sure if we’ve ever had Jay’s. Amen on the hot dogs sista! We just make them ourselves because no one comes close in town. I haven’t tried Bravas Dogs yet though… so I am holding out hope. Thanks for the offer on the import. I will actually be in IL at the end of the month myself.